Man has in him two distinct master impulses, the individualistic and the communal, a personal life and a social life, a personal motive of conduct and a social motive of conduct. The possibility of their opposition and the attempt to find their equation lie at the very roots of human civilisation. The upcoming decades will be different from what has gone before. Our global society is in the midst of great transformations that will usher in new social and cultural formations. Many nations have been living the high life as a result of the prosperity afforded by rapid industrial, technological and material growth. The long tail of this — the technological revolution — has been fundamental in stretching tentacles of dependency far and wide. Complex structures of supply, demand and energy are now near to their breaking points. The new century for humankind begins as the traditional structures provided by governments and social and political institutions are overwhelmed and no longer capable of serving humankind in its best interests. Problems and difficulties are likely to continue rising up, like a tsunami, and manifesting in our immediate social environments. Yet unlike a natural tsunami, these social uprisings can also serve to clean the slate and clear the brushwood. They can provide the opportunity for individuals and communities to re-evaluate their life priorities. It can be a time for reconstruction and reorientation based on newly-emerging perceptions of how better to lead a fulfilling life. Yet this outcome, perhaps, will not be for everyone: There will still be many who choose to return to the old, familiar, tried-and tested ways. However, this will prove difficult, as some of the old systems will no longer be functional. New forms of social innovation need to be encouraged to emerge from the chrysalis of the fossilized structures. By this it is meant that more appropriate and creative social, economic, technological, cultural and political edifices can replace current dysfunctional systems. For example, new — or previous — skill sets can return for inclusion in our social and community roles. This may force many people to shift from office and administration jobs, from the service and manufacturing sectors, toward functions that serve a regional and localized need. These may include community teaching (in both theory and practical skills), maintenance and construction, localized economies (both currency and barter), permaculture, farming, creative inventions, regional management, community committees and more. Many farms may need to shift (or return) to organic forms of agriculture and crop growth in order to combat the rise in soil depletion. As many of us are now aware, petrochemicals and synthetic fertilizers negatively polarize the soil. While they may produce apparently abundant growth in the short term, in the long term they deplete the soil and exhaust its natural growing capability. The food produced is thus often lacking in nutrients and minerals. In short, many methods now employed will be forced, or catalyzed, into change. Never doubt that individuals have the necessary skills to respond to critical needs. As the expression goes, necessity is the mother of invention. New knowledge sets can be learned and passed on; apprenticeships can become widespread once again as sustainable skill sets become more valuable and appreciated than institutional and service-sector jobs. Never doubt that communities can find the resources to reshape local cohesion and growth. Creativity and inventiveness are central to the human talent for tinkering. Innovation is the prerogative of people, not the governments. Let us not forget that transformation comes from the tiniest changes. We have been waiting for the opportunity and challenge to adjust to new changes. In this respect, we have been waiting long enough for what will be an epochal transition. The challenges facing us are not so much about a “one-off change,” which once enacted will leave us to sit comfortably in our newly-adapted state. Rather, we are being encouraged to shift into a permanent state of adaptation so as to be better placed to face uncertainty. Such uncertainties may push social affairs toward reorganization at more contracted levels and scales of activity. In the face of these contractions, individuals need to start thinking soon about what courses of action to take. We can walk into the future willingly, or we can be back-flipped kicking and screaming like children. Either way, it seems highly likely that novel social innovations are coming down the line. According to social commentator James Howard Kunstler, those of us who presently live in the comfortable Western countries are facing “the comprehensive downscaling, rescaling, downsizing, and relocalizing of all our activities, a radical reorganization of the way we live in the most fundamental particulars.” This may come as a shock to many people who are still somewhat unaware of the vast changes occurring in the world today. Yet does this mean we are to be transported back into the Dark Ages where tumultuous events will play out over a prolonged period of time? Not necessarily; rather it may be the case, I suspect, that once the social turbulence has passed, which may well be a relatively short-lived situation rather than a protracted one, there will be a different kind of age. It may well be a return to values and relationships no longer obscured by unbalance and folly. And it could very well lead to a new century of social innovation. This is my hope. Kingsley Dennis, PhD, is a sociologist, researcher, and writer. He co-authored After the Car (Polity, 2009), which examines post-peak oil societies and mobility. 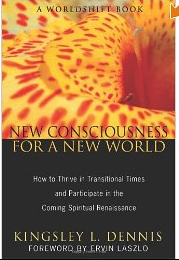 He is the author of the forthcoming book New Consciousness for a New World (2011); as well as The Struggle for Your Mind: Conscious Evolution & The Battle to Control How We Think (2012). He is also the co-editor of The New Science & Spirituality Reader (2012). Kingsley worked in the Sociology Dept. at Lancaster University, UK, and is now a visiting fellow at the Centre for Mobilities Research (CeMoRe) at Lancaster Uni. He is now collaborating with the new paradigm Giordano Bruno GlobalShift University, a co-initiator of the Worldshift Movement and co-founder of WorldShift International. Kingsley is the author of numerous articles on complexity theory, social technologies, new media communications, and conscious evolution. He can be contacted at his personal website.